This hi-tech office building features a full height glazed entrance, which overlooks the surrounding area and is guaranteed to impress. There are a range of offices on offer including window and interior office, office suites with meeting rooms attached and coworking spaces with hot desking availability. Next to the business centre you will also find a choice of 2 restaurant, where you can enjoy your lunch or dine with business contacts. Kuppis Park is within walking distance, offering leisure activities such as a swimming pool, bowling alley and football field. This outstanding, well designed centre is close to public transportation, and offers customer parking. The area has vast, expansive spaces to explore and enjoy outside of work. Restaurants and the local marketplace are also close-by. This is a comfortable and stylish workspace, spread across two floors. These attractive turnkey offices come with videoconferencing facilities for convenience and versatility. This vast building was once an electro-ceramic factory and has been fully renovated to provide bright and sophisticated modern office space whilst keeping the original charm of the construction. Leaseholders have access to relaxing public areas as well as an in-house restaurant, an impressive conference auditorium and meeting rooms. 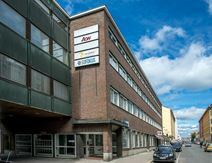 It is minutes’ from Kupittaa rail station and a short way from central Turku. Second floor modern office space with pleasant communal areas and IT support to ensure your company remains well connected. The suites have use of shared kitchen facilities, a caféteria and on-site car parking. This property has a prominent main road setting near to the riverside and railway station. There are lots of art galleries, museums, cinemas and performing arts theatres in the area. Just a short drive away is a number of excellent events venues.